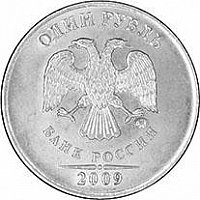 In the center - the emblem of the Bank of Russia (the two-headed eagle with wings down, under it - the semicircular inscription: "БАНК РОССИИ"), under the right paw an eagle - mint mark of the manufacturer. At the top along the rim - lettering of the coin: "ОДИН РУБЛЬ". In the lower part of the disc - two horizontal lines separated by a dot, beneath - year of issue. Since the second quarter of 2009, the Bank of Russia 1 ruble coin is made of nickel plated steel. Material coin has ferromagnetic properties. 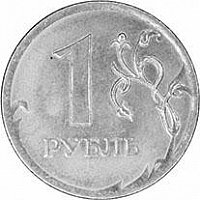 In the center (close to the left) - the denomination of the coin: the figure 1, under it - the word "РУБЛЬ", arranged horizontally.